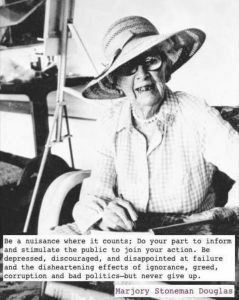 Marjory Stoneman Douglas (April 7, 1890 – May 14, 1998) was an American journalist, author, women’s suffrage advocate, and conservationist known for her staunch defense of the Everglades against efforts to drain it and reclaim land for development. As a young woman Douglas was outspoken and politically conscious of the women’s suffrage and civil rights movements. I want to give honor to her legacy by encouraging others to stand with students everywhere in the upcoming protest marches to end gun violence once and for all. 4 million students turn 18 in the next 8 months, that’s four million new voters. Below is more of her legacy accomplishments, and a couple of memorable quotes. Sometimes heroes are where we haven’t been looking; sometimes in our own backyards. Marjory did it her way! Thank you for looking out for the rest of us, Marjory. May we be good care taker’s and may we all be nuisances where it counts. Douglas spoke about the damage the Army Corps of Engineers was doing to the Everglades by diverting the natural flow of water. The Corps was responsible for constructing more than 1,400 miles (2,300 km) of canals to divert water away from the Everglades after 1947. When the Central & South Florida Project (C&SF), run by former members of the Corps of Engineers, was proposed to assist the Everglades, Douglas initially gave it her approval, as it promised to deliver much-needed water to the shrinking Everglades. However, in application, the project instead diverted more water away from the Everglades, changed water schedules to meet sugarcane farmers’ irrigation needs, and flat-out refused to release water to Everglades National Park, until much of the land was unrecognizable. Douglas began accruing honors in her early days writing for The Miami Herald. In the 1980s, the awards became more prestigious, and her reactions to them mixed. The Florida Department of Natural Resources (now the Florida Department of Environmental Protection) named its headquarters in Tallahassee after her in 1980, which she considered a dubious honor. 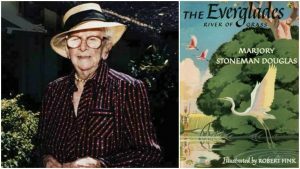 She told a friend she would have rather seen the Everglades restored than her name on a building. During her polite acceptance speech, she railed against Ronald Reagan and the then-Secretary of the Interior James Watt for their lackluster approach to environmental conservation. 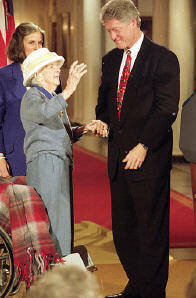 In 1986 the National Parks Conservation Association established the Marjory Stoneman Douglas Award, which “honor(s) individuals who often must go to great lengths to advocate and fight for the protection of the National Park System“.Despite blindness and diminished hearing, Douglas continued to be active into her second century, and was honored with a visit from Queen Elizabeth II, to whom Douglas gave a signed copy of The Everglades: River of Grass in 1991. Instead of gifts and celebrations, Douglas asked that trees be planted on her birthday, resulting in over 100,000 planted trees across the state and a bald cypress on the lawn of the governor’s mansion. 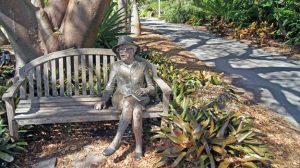 The South Florida Water Management District began removing exotic plants that had taken hold in the Everglades when Douglas turned 102. In 1993, President Bill Clinton awarded her the Presidential Medal of Freedom, the highest honor given to a civilian. 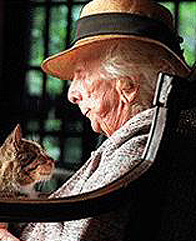 The citation for the medal read, “Marjory Stoneman Douglas personifies passionate commitment. Her crusade to preserve and restore the Everglades has enhanced our Nation’s respect for our precious environment, reminding all of us of nature’s delicate balance. Grateful Americans honor the ‘Grandmother of the Glades’ by following her splendid example in safeguarding America’s beauty and splendor for generations to come.” Douglas donated her medal to Wellesley College. Most of the others she received she stored at her home. I had no idea this woman accomplished so much. I n fact, I hadn’t’t even heard of her. Now I shall never forget her. Thank you for this informative article. Keeping her alive by deeds being done. I just want to say I’m newbie to blogging and site-building and absolutely savored this blog site. Very likely I’m going to bookmark your blog post . You definitely have awesome writings. Regards for sharing your website page.